Examining the wide-ranging implications of Ruskin's engagement with his contemporaries and followers, this collection is organized around three related themes: Ruskin's intellectual legacy and the extent to which its address to working men and women and children was realised in practice; Ruskin's followers and their sites of influence, especially those related to the formation of collections, museums, archives and galleries representing values and ideas associated with Ruskin; and the extent to which Ruskin's work constructed a world-wide network of followers, movements and social gestures that acknowledge his authority and influence. As the introduction shows, Ruskin's continuing digital presence is striking and makes a case for Ruskin's persistent presence. 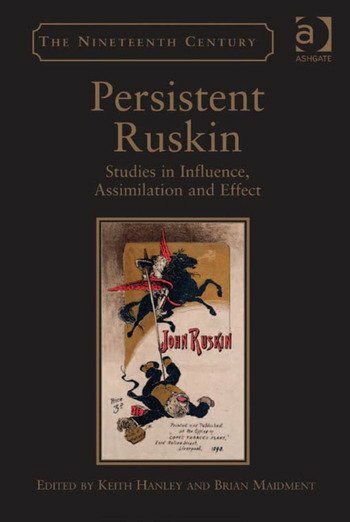 The collection begins with essays on Ruskin's intellectual presence in nineteenth-century thought, with some emphasis on his interest in the education of women. This section is followed by one on Ruskin's followers from the mid-nineteenth century into twentieth-century modernism that looks at a broad range of cultural activities that sought to further, repudiate, or exemplify Ruskin's work and teaching. Working-class education, the Ruskinian periodical, plays, and science fiction are all considered along with the Bloomsbury Group's engagement with Ruskin's thought and writing. Essays on Ruskin abroad-in America, Australia, and India round out the collection. Keith Hanley is Professor of English Literature at Lancaster University, where he directed the Ruskin Centre from 2000-2008. Other Ruskin-related publications include John Ruskin’s Romantic Tours 1837-1838: Travelling North (2007) and, with John Walton, Constructing Cultural Travel:John Ruskin and the Direction of the Tourist Gaze (2011). Brian Maidment is Professor of the History of Print in the English Department at Liverpool John Moores University. He is the author of Comedy, Caricature and the Social Order 1820-1850.